Turbulence Ahead: 2008: Year Zero for Consumers? 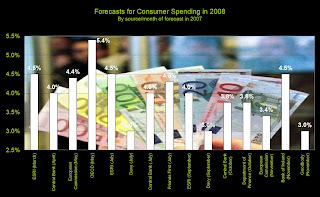 I'm increasingly nervous about the outlook for Irish consumer spending next year. The consensus is still for modest growth - even if the consensus on 2008's prospects has weakened in recent months (see chart which shows changes to 2008 forecasts through the course of 2007). Curiously, the stockbrokers seems more pessimistic than public sector forecasters about the outlook for spending next year. Though Bank of Ireland have produced the most optimistic forecast by far in recent months. 1. Goodbody's are forecasting that the inflation rate will be greater than the volume rate of growth of consumer spending - the first time this has happened since 2001/2002. This means that most of the growth in spending next year will be driven by inflation, providing little real growth stimulation to the economy (and probably making consumers more price conscious and focused on value for money). 2. Goodbody's are also forecasting that real household disposable incomes will grow by only 0.1% in 2008 - in effect, zero growth in spending power (further reinforcing consumer awareness of value for money). Of course, these are only forecasts - subject to revision like all the others. As with all impressions about the future, we must guard against 'projection bias' - our psychological inclination to assume that our experiences in the present are the best guide to the future. Nevertheless, at this late stage in the year, it would be advisable to think again about any significant price increases you may have pencilled in for 2008. In a year that could see zero growth in spending power, your price increase might stick out like a sore thumb. Which would really hurt.